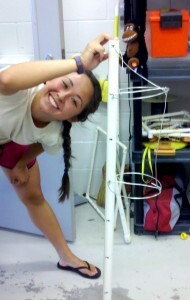 My experience working on the ZEN project in Dr. Mary O’Connor’s lab this past summer was simply fantastic. It was great to have a summer job that I was really passionate about; anytime anyone asked me what I was doing for the summer, they were in for more than just a one-sentence answer! It was also great to share the experience with many other passionate biologists; we had an amazing group of workers and volunteers. Even when it was rainy and windy and our hands were numb, we knew we were lucky to be doing what we were doing! 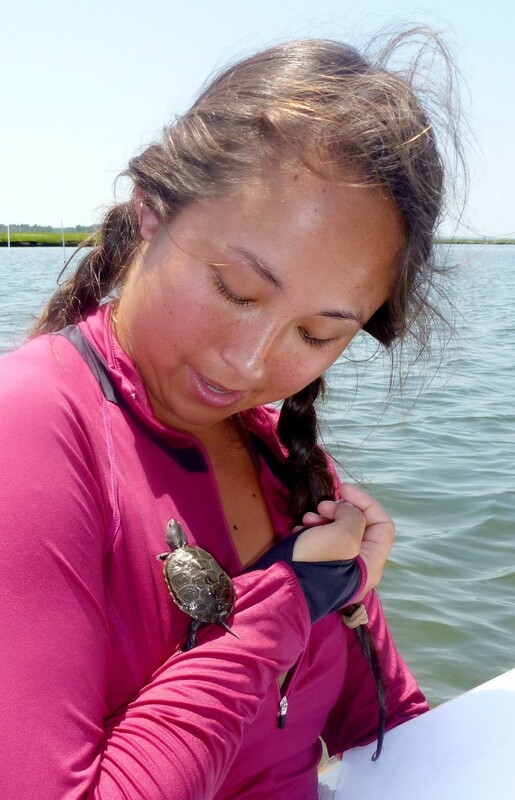 I am grateful to have had such an amazing opportunity, especially as an undergraduate and working on the ZEN project has certainly inspired me to continue studying the fascinating communities that inhabit Zostera marina beds. I am also excited to see the results of the ZEN projects from all of the different sites! 1. Pile into the U.B.C. Zoology van with equipment and keen volunteers. 2. 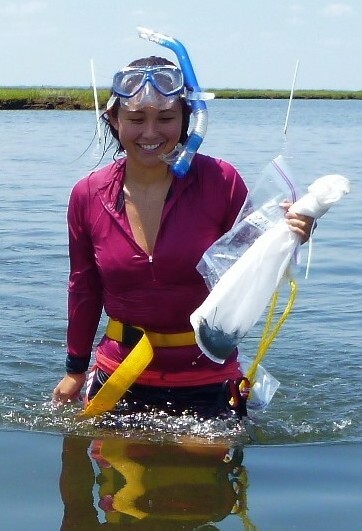 Arrive at the field site, put on (leaky) chest waders and sun hats or rain jackets (typically the latter). 3. Head down the 300 or so stairs to the beach, pass all of the locals getting their daily exercise and wearing ‘what are you guys up to’ looks on their faces. 4. 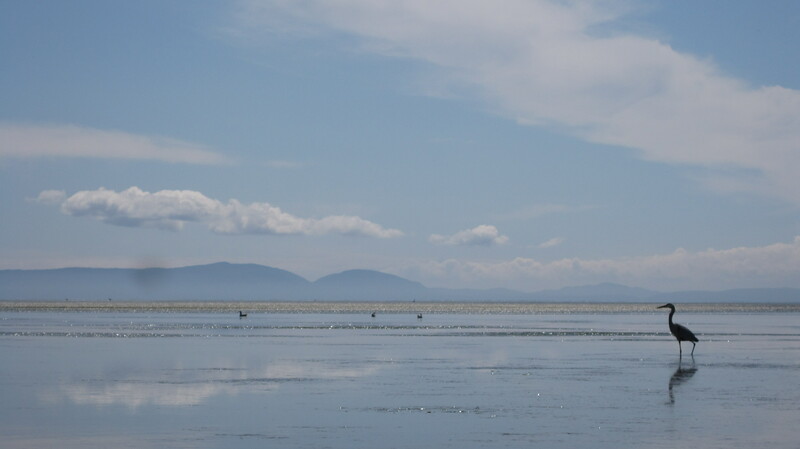 Head out onto the mud flats, try not to stop moving or risk getting stuck in the really sticky mud. 5. Go about whatever task we had set out to do that day. 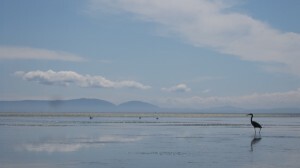 Meanwhile, enjoy the beautiful scenery – the nearby Gulf Islands, the B.C. Ferries sailing across the Straight of Georgia, and hundreds of foraging herons. 7. Empty the leaky waders. 8. Go to Tim Horton’s to get iced caps or hot chocolates (typically the latter) before heading back to U.B.C. 9. Go home feeling like the luckiest people in the world! 1. Finish and submit those pesky, lingering manuscripts. 2. Apply for more funding. 3. Make more time for broad reading of the literature. 5. Go digital and print less. 6. Appreciate the learning experience that comes with syntax errors in my statistical analysis coding. 7. Get out into the field more. 8. Spend less time fiddling with powerpoint slide aesthetics. 9. Fix that tear and other leaks in my wetsuit. 10. Bring healthy snacks into the field. 11. Cleanup my e-mail inbox. 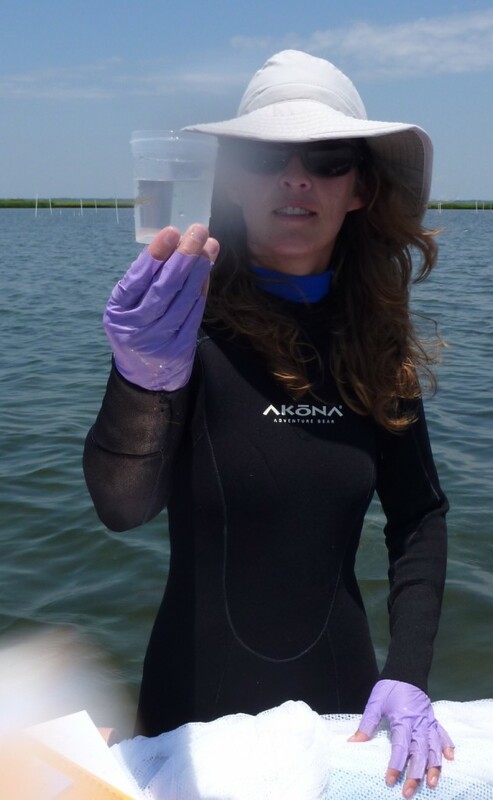 I was excited to participate in the ZEN project because of the preliminary work I did for my Master’s research under Dr. Emmett Duffy at the Virginia Institute of Marine Science (VIMS) to test the methods in seagrass. 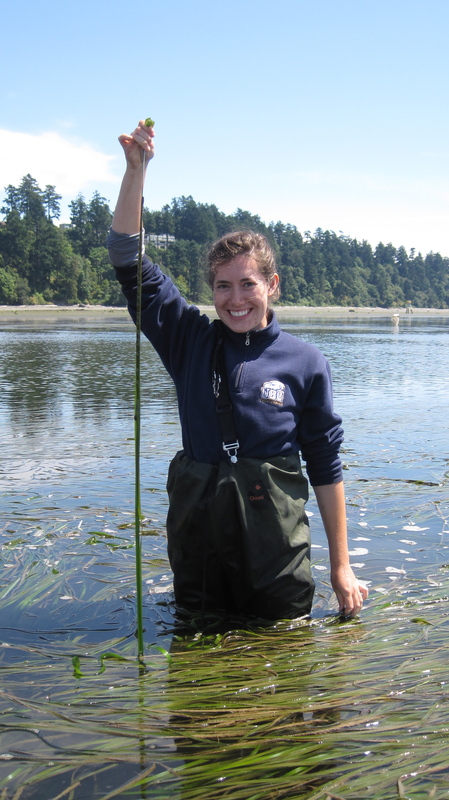 I was also excited for the chance to get up close and personal with eelgrass (Zostera marina) in different parts of the world. I had visited eelgrass beds in Boston, Massachusetts, Bodega Bay, California, and Vancouver, Canada while visiting grad schools, and played around in tropical seagrasses in Florida while helping out with a seahorse research project a few years ago, but the bulk of my research experience in seagrass was focused on the lower Chesapeake Bay. When I found out that I would be traveling to Japan to work on not one but two of the ZEN experiments, I felt like a boyhood dream had come true. Sappy, but it’s 100% accurate. My father lived in Japan for a number of years while he was in the navy, and growing up I heard a lot of stories about his time there that romanticized the whole thing for me. He even promised me (around the time I started tying my own shoes) that we would travel to Japan together one day to climb Mt. Fuji. The timing of the trip could not have been more perfect. 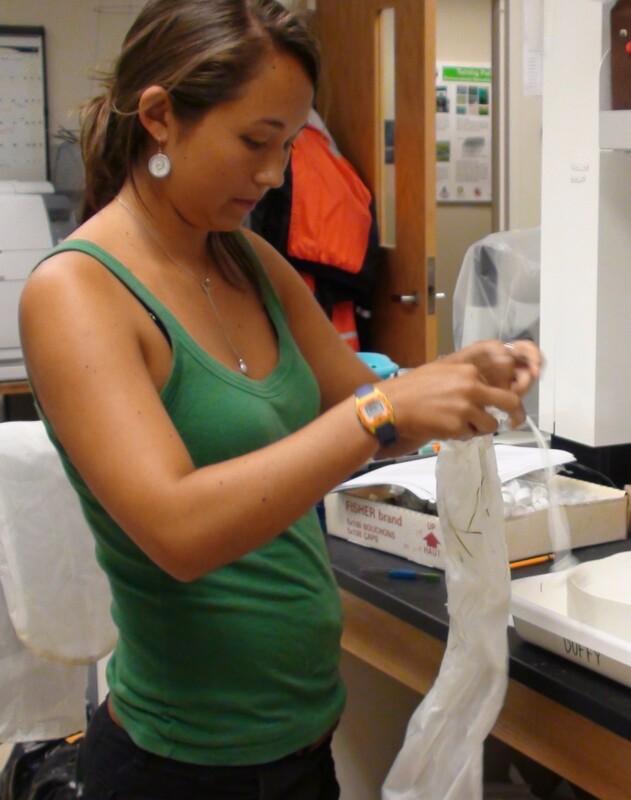 At the conclusion of my Master’s degree at VIMS and before beginning my PhD at UC Davis. I spent a month and a half in the land of the rising sun. My time was split between Hiroshima Prefecture, Tokyo and surrounding areas, and the northern island of Hokkaido. No amount of Japanese anime (my favorite series being Cowboy Bebop and my most recently viewed film a Japanese rendition of the Little Mermaid named Ponyo) could have prepared me for how amazing this trip would be. My first impressions were actually in the airport and during the flight. I had scored direct flights from Washington, D.C. to Tokyo and I flew with ANA (All Nippon Airways)…“Nippon” and “Nihon” are Japanese (Nihongo) for Japan, and I’m not sure how “Japan” came into use. As is often the case (for me, anyway), international flights are far superior to domestic US flights, and ANA exceeded anything I had experienced before (I’ll let the better-traveled out there decide whether ANA or international flights generally are superior). There are few times in my life that I can honestly say that I was terrified. Feeling the Loma Prieta earthquake in ’89, (nearly) tripping over a cottonmouth snake, taking my qualifying exams all stand out. So does the 28th of June in 2011. It started out as a normal day, or at least as normal as a day of fieldwork can go at the ZEN site in Virginia. 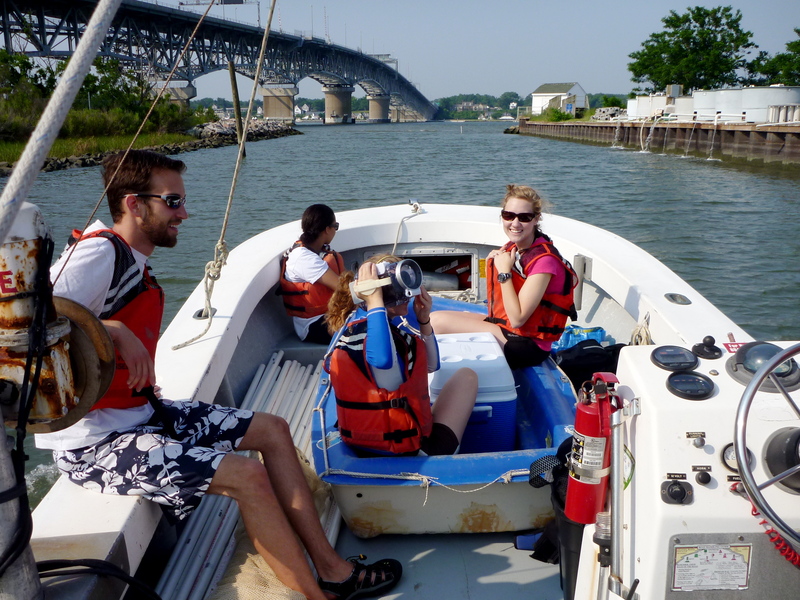 It began with the usual flurry of activity in the early morning packing the experimental equipment and loading the boat, checking the associated weather websites and filling out the float plan, slathering on sunscreen and pulling on life jackets and dive booties. It was a typical hot, humid, and sunny summer field day in coastal Virginia. As is customary, when we arrived at the site Captain Paul cranked up the VHF radio to the weather channel and its droning computerized voice began babbling in the background. 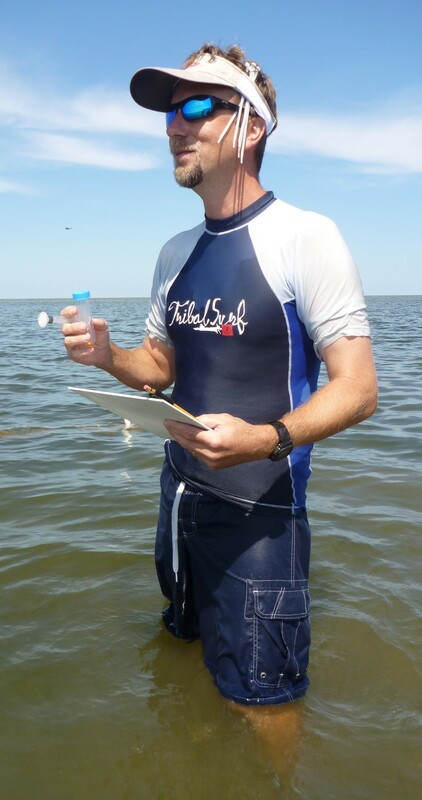 We set anchor, grabbed our masks and associated collecting gear, hopped into the water, and got to work. 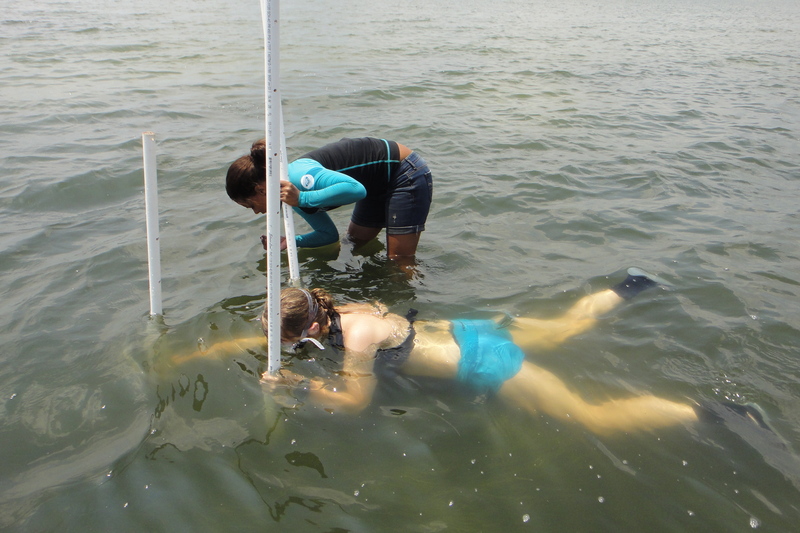 We were collecting seagrass shoots to measure growth rates, which involved a lot of swimming and diving among our experimental plots in what we affectionately called the ZEN Pole Garden. On about plot number 22, half way through our collections shortly after 3 o’clock in the afternoon, it started. That dreaded cacophony over the VHF radio followed by the ominous blaring of the weather alarm and the warning statement that can mean only one thing – storm! One morning, bright and very early, the North Carolina ZEN team packed up the truck and with all the necessary materials for the initial set up of all 40 experimental plots for our experiment. 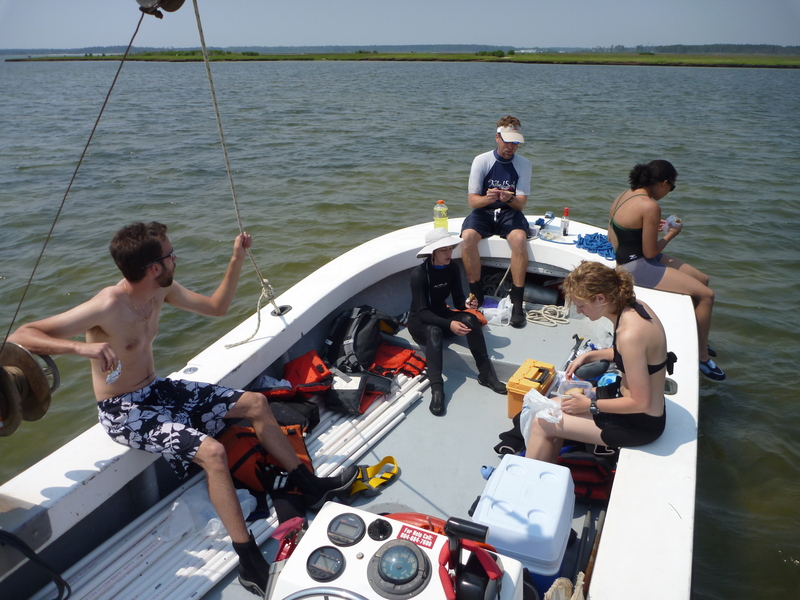 We arrived at our field site behind the Pine Knoll Shores Aquarium and the weather was absolutely beautiful, sunny and warm but with a cool breeze. The tide was calm and the Zostera seagrass beds were vast and lush. After briefly meeting with the aquarium staff our group got started right away, driving the 120+ poles needed to mark the experimental plots into the sediment. About half way through Pamela began to check some of the plots to make sure they had enough Zostera (we were aiming for a minimum of 80% cover). As it turns out what we thought were lush beds of Zostera were actually composed mainly of a different type of seagrass – Ruppia! You can understand that this is a problem given that we are working on the Zostera Experimental Network (ZEN) and not, well REN! 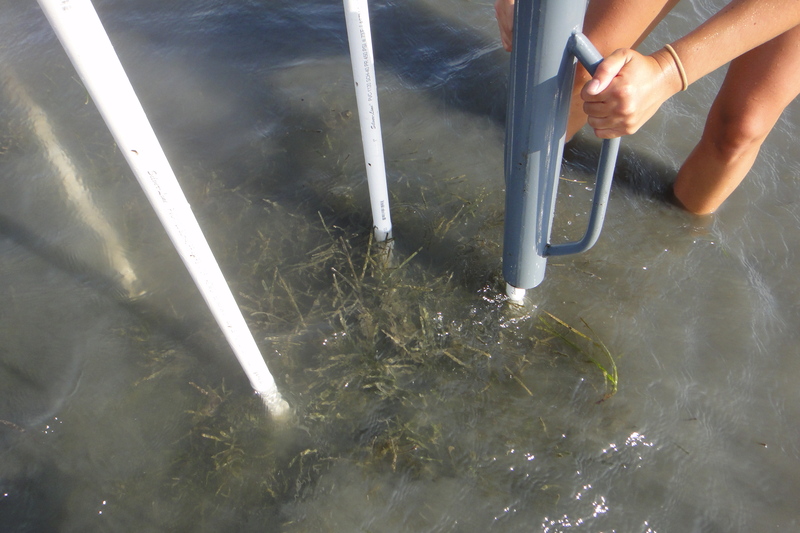 We had spent all morning driving poles into the sediment only to discover that we had been deceived by the seagrass. In disbelief that we could have made such a mistake, we checked and double-checked the plots. Then we went on an extensive Zostera hunt, searching endlessly for a hint of a healthy Zostera bed, swimming through the seagrass even under the threat of being hit in the face by jumping mullets! Turns out it was all in vain and it was back to the drawing board for the ZEN-NC site. What had been an extensive Zostera bed two years before had been replaced almost entirely by Ruppia and some Halodule seagrasses. We spent hours pounding in the poles only to pull them back up the next day. Fortunately, Pamela, Erik and Rachel were able to work out the logistics for us to work at a new site nearby in Middle Marsh that was actually filled with beautiful, lush Zostera. Even though we had to re-set all of the poles, it turned out to be a wonderful, protected site that was a pleasure to work in. May I have the drum roll please . . . Welcome, Ladies and Gentlemen, to the new official online home of the Zostera Experimental Network, known informally as ZEN. We are a global network of marine ecologists and evolutionary biologists from 15 sites (so far!) around the world, united in a quest to figure out how ecosystems associated with eelgrass (Zostera marina) work. The project has been seeded with generous support from the US National Science Foundation. 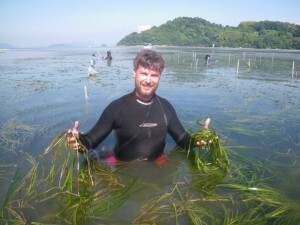 Eelgrass is one of the most widespread and important plants of the world’s shallow coastal seas and estuaries, ranging from above the Arctic circle to the balmy climes of Portugal, North Carolina, southern California, and southern Japan. ZEN has partner sites in all of those places. 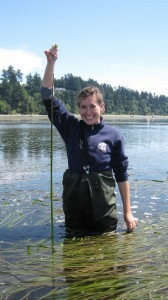 Extensive meadows of eelgrass support rich and productive biological communities of fish and shellfish, and provide important living buffers against storm and hurricane damage. As you might imagine, environmental pressures differ profoundly acros its broad range, from the glacial landscapes of northern Norway to the sweltering heat of the American southeast, as do the types of animals that live among the eelgrass. 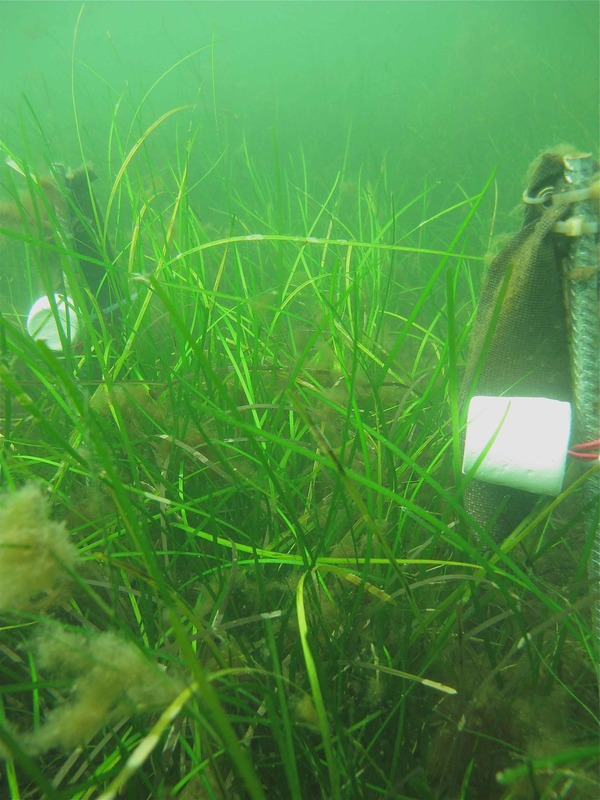 For these reasons, eelgrass beds are ideal candidates for exploring how gradients in environment and biodiversity influence the complex functioning of ecosystems. ZEN is coordinated by myself and Dr. Pamela Reynolds at the Virginia Institute of Marine Science. 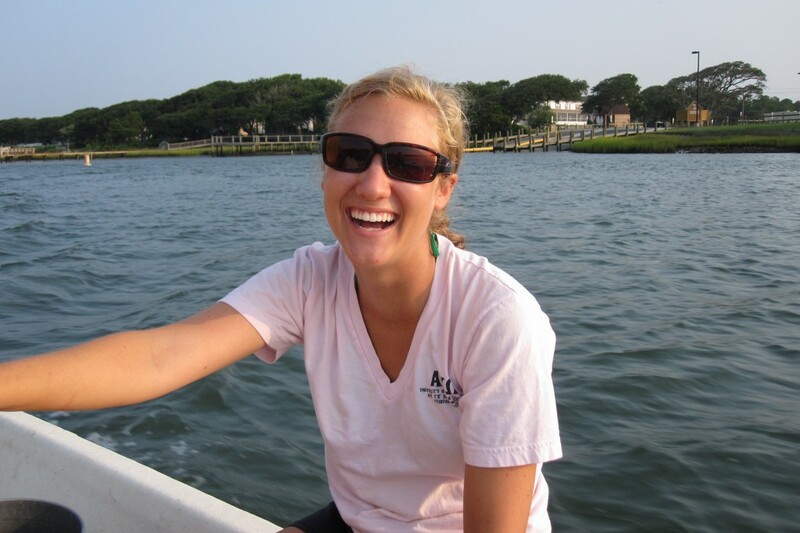 We started officially in December of 2010 with a kick-off meeting that brought partners to Williamsburg, Virginia to plan strategy and finalize methods for our first big field experiment conducted in summer 2011. 1) A list of ZEN’s participating partners and a little about the sites where they are working here. Stay tuned to the ZEN blog for updates on activities throughout the network. 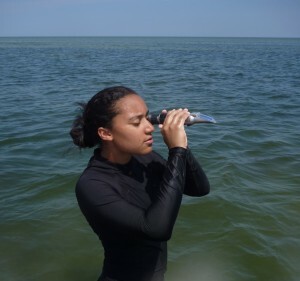 2) A summary of the 2011 field experiment here — and first-hand accounts of the experiences of some of the students and others that participated here. 3) News of ZEN activities, publications, and research findings here. And of course you can always leave a comment or send us an email using the little box at bottom of the page. Thanks for visiting. Y’all come back!